I have to admire Frank Delano, the man who took the photos I used for these first three paintings (and more). This photo would stand out if the others weren’t also so fine; the details he’s able to capture and the expressions on these women’s faces—it’s all gold. Frank’s photographs became quite famous over the years, iconic even. My painting of Irene is his composition with no real changes except I cut off the bottom few inches. Again, I wanted more emphasis on the face. Irene has an open and earnest face. I can’t tell if that’s sunlight shining down on her or a photographer’s lighting. Irene is sweating and flushed, stray wisps of hair plaster to her forehead, which seems to bulge a bit while she tucks her chin in, doubling it and giving her the impression of a straight-backed, sober and serious young woman. She also despises her situation, but prefers not to dwell on it. Her situation is the same as the rest: children at home (probably with mother or neighbors or friends or at school? ), man at war. 1943 was a tough year. Why did I paint Irene? When I searched for things to paint, I’d sift through thousands of old photos for something to catch my eye. Often when I’d find a photographer I admired, I would paint many of his or her photos, as you’ll see. This is the beginning of my artistic process: searching for what I want to paint. Learning to “see” as an artist is something I’ve had to develop. Often, I will paint something or someone because I already painted it in my head—or in other words, I already solved all the painting’s problems. Putting the paint down after that is just sort of the cake. Other times, I’ll begin with a color or an emotion I want to portray…. and other things. I think I ended up painting strong women because they were what I wanted to look at. They were what I wanted to see and to be. Part of my process for painting ladies was to project the photo wall sized so I could see all the details. When I’m able to see a photo as large as that, I see things a small photo on a computer screen doesn’t reveal. My discoveries are usually delightful, sometimes disturbing, and once made me quit painting it altogether…. but I’ll get to those ladies…. What did I discover gazing into the face of Irene Bracker? Her false eyelashes. In this world where she is literally surrounded with soot and filth and black coal dust everywhere, there are few opportunities for self-expression. I measured her eyelashes, and there was no way they were natural. I mean, what a place to wear false eyelashes. They must have brushed her goggles, they were that long. This is why in my painting I emphasized the false eyelashes—so you could see what’s actually there but couldn’t see in the photo. And actually, it’s difficult to paint make-up on a painting of a face. Make-up is meant to augment certain features and seeks to trick the eye in various ways. Painting works in much the same way, so painting make-up is a bit like painting someone else’s painting—or like applying make up to any face. Back to Irene. In my painting, I made the eyelashes and lipsticks more visible. Her rigid demeanor comes off as a slightly more Frankensteinish. Also, I did not do a very good job of blending the lines around her nostrils. But if you can ignore all that, I suppose I get my point across…. This may be another case where I think the photo displays more interesting complexity than I was able to capture in my version, but my painting also emphasizes certain features to make my own point—the way a director can interpret a script. Her make-up makes her look more feminine, that’s for sure. Though everything else about her is manly—including her frank stare. One big change between photo and painting is that I did not use black in this one—though black dominates the photo. I wonder how my photo would change if I inked out the trains and gray mist to her side—made it all black coal and iron? If I did that, Irene would glow in her shaft of noonday sun, like a goddess on fire. Might be interesting to try…. I like Irene’s yellow scarf wrapped around her head. The goggles never get old. And then those false eyelashes and ubiquitous lipstick. 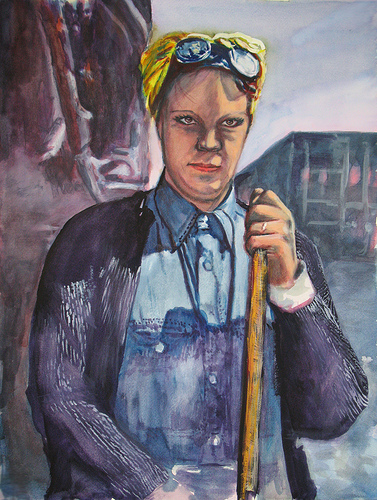 In my painting, I wanted to emphasize the disparity of the details—to show the woman’s social norms of beauty observed amidst this degree of filth and manual labor. Her make up contrasts the simple lines of her sweater and rough denim work shirt. I like how the shadow of her goggles falls across her chest and forehead and her grip on that wooden handle—like it’s holding her up—her hand revealing the wedding ring and her commitment to America’s institutions. I’m aware that the photo Frank Delano took of Irene is already art. I don’t seek to replace his photo, but to use it as a vehicle by which I can express her emotion and my own emotion and agendas. I use the details of Irene that Frank recorded with his camera. I am literally seeing Irene through his eyes. And when I paint her, we are all seeing his Irene through my eyes and down my arm and onto my paint brush. In this way, I am her—I suppose in the same way a novelist is each of his characters but not really. When I paint a lady, I translate her. I think that’s why I always felt that these ladies are mine.